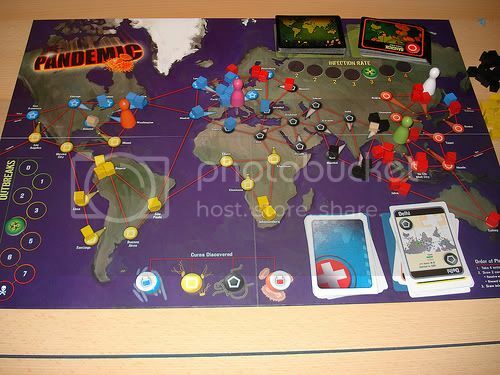 One can hardly talk about cooperative games without taking about Pandemic, a cooperative board game made in 2008 by Matt Leacock, which has garnered enough awards since then to fill a bookshelf and has received a great deal of critical acclaim as well. In Pandemic, two to four people cooperate to stop four diseases (represented by differently coloured cubes) by going around major cities on a world map and using their cards to build research stations, treat people, and try to find cures for each disease. The players must scramble to find the cures for the four diseases while trying to keep outbreaks in check before they take over the world. Pandemic's core is the world map and the cards. There are two card piles: the draw pile (for the players) and the infection pile (for the diseases), each containing one card for each city. Each player gets a role, drawn randomly: the dispatcher (who can move other people's pawns, with their permission), the operations expert (who can build research stations without having to spend cards), the scientist (who can cure a disease with 4 cards of matching color instead of 5, which is more important than it sounds), the medic (who can treat diseases more effectively), and the researcher (who can give anyone any card as long as they are on the same city). The roles are well-balanced, and do not force the players into a specific "job." Pandemic has the reputation of being very challenging. 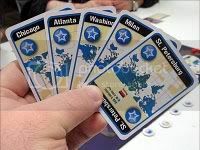 One reason is because the players only have access to one card for each city, and must always make difficult decisions on how to spend or not spend each card. There are just so many things that you can do with a card: you can use it to travel there, to build a research station there, or use it as part of a cure. Also, a player can perform up to four actions per turn. Because the players can do a lot but have so little resources, constant communication and planning is of prime importance. 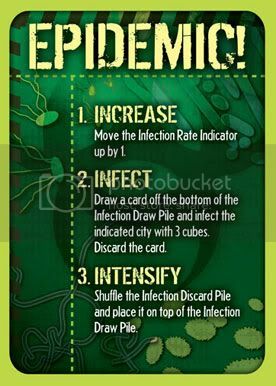 The other aspect that brings a high level of challenge to this game is the mechanics for handling the spread of disease. Normally, up to four cards are drawn from the infection pile and one cube of disease is added to each of these cities. But when an Epidemic card is drawn, the real trouble begins. A card is drawn from the bottom of the pile and given three disease cubes, and all the infection cards that were discarded are put back at the top of the pile, meaning that the cities that were infected in the past are now ready for infection again. The one card you don't want to see. Even more dangerously, if a city has three cubes and is slated to get another, this is called an Outbreak. Instead of that city getting a fourth cube, all cities surrounding it get a cube of the same color! If you haven't been treating cities well enough, this spillover can trigger a chain reaction, and each instance of spillover counts as an Outbreak. Eight Outbreaks and the game is lost. The game is also lost if a cube of a certain color must be added but there are none left, or when the players have no more cards. This game is consistently described as difficult, but it's the good kind of difficult. The luck element is secondary to the hard decisions that the players have to take on a turn-by-turn basis, although of course luck plays a role in making games more or less difficult. The relatively abstract mechanism of disease spread is very effective. The difficulty level is also very easy to customize (simply use more or less Epidemic cards). It is easy to see why Pandemic has captured a lot of people's imaginations. Why did I include two games on one page? Because Forbidden Island is basically a simpler version of Pandemic, made by the same author, with a different theme. 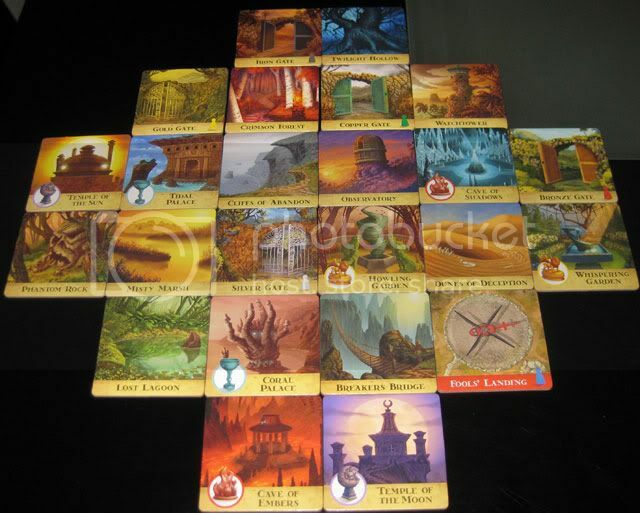 Forbidden Island is a game played on an "island" made of 24 tiles, containing four treasures that must be collected before the island sinks into the sea. Four cards corresponding to a treasure must be discarded on a tile containing that treasure to gain it. There are six roles: in this case, the explorer (who can move to, and shore up, more tiles), the pilot (who can move anywhere), the navigator (who can move other players), the diver (who can move through flooded tiles), the messenger (who can trade cards with anyone), and the engineer (who can shore up two tiles at a time). The diseases are replaced by the water rising on random tiles drawn every turn, and the infection pile is now a flood pile, although there is no equivalent to Outbreaks in this game. A tile can either be dry, partially flooded, or completely flooded, making it impassable. Strategy is needed to keep everyone alive and to keep a dry path so everyone can leave the island. Tiles can be "shored up" to convert them from partially flooded to dry. While Forbidden Island is easier than Pandemic, both in rules and in play, there is still a strong sense of urgency as it becomes impossible to keep all the tiles dry and time starts running out. I think the whole "sinking island" is a wonderful concept, although it still doesn't beat the concept of Outbreaks. If you are the maker of this game, or if you have played it and want to submit a review, please email me.